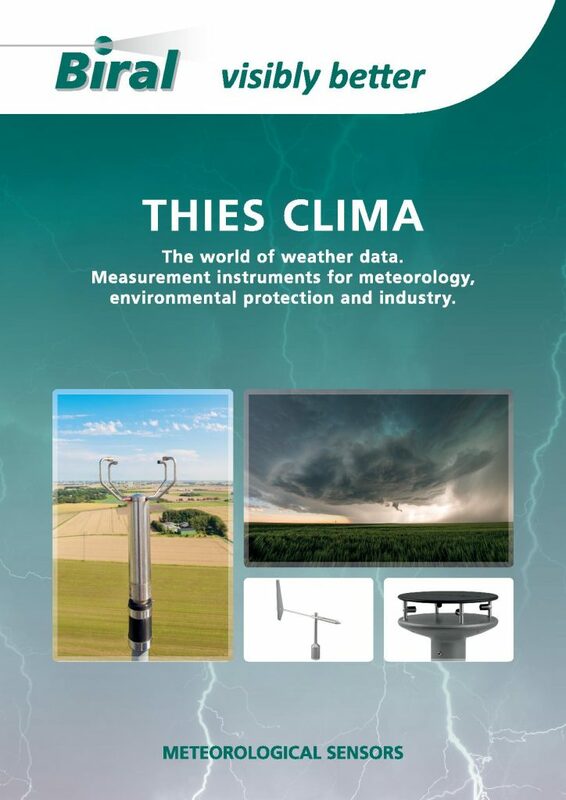 The Thies Clima ranges of meteorological sensors are highly respected and wide ranging and Biral’s new brochure provides information on measurement solutions for wind, precipitation, temperature, humidity and pressure applications plus multi-functional compact weather stations. The Thies product range offers a wide choice of traditional cup and vane wind speed and direction transmitters to measure various ranges with accuracies and output signals that cover virtually all application requirements. These sensors can be used in meteorology, environmental technology, wind farm site survey, marine and off-shore and traffic control applications. Other wind sensors include Ultrasonic Anemometers which have no moving parts, making them especially suited to challenging and safety critical environments such as airports and helidecks. With no moving parts to wear out, maintenance requirements are low, making ultrasonic devices ideally suited to remote locations like off-shore wind farms and mountainous regions. Two Compact Weather Stations are included in the Thies product range, each combining a number of standard meteorological sensors into a single, easy to use package. These compact stations are used extensively in building control and general meteorology applications but are ideally suited to road weather stations and due to their light weight and adaptability, can also be used in mobile applications such as roadside warning signs. Thies has been developing, producing and supplying instruments and systems for the analysis of weather data for more than 70 years. Biral is the official UK distributor for Thies products and Steve Goodfellow is Biral’s UK specialist for the Thies range. Image: Meteorological specialists, Biral, has just introduced its new product range of equipment from Thies, for meteorology, environmental protection and industry.